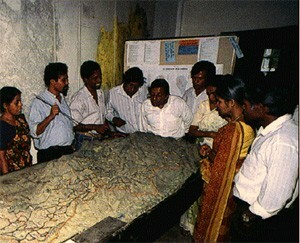 This 1:20,000-scale 3D model of the Upper Mahaweli Watershed was completed in Sri Lanka in year 1987. A series of models were manufactured in the framework of the GTZ-funded Upper Mahaweli Watershed Management Project (UMWP) and further used in the context of a second GTZ-funded regional rural development project operating in Kandy District, the Regional rural Development Project (RRDP). The Mahaweli Authority of Sri Lanka (MASL) implemented the UMWP for soil conservation and watershed management purposes in coordination with other implementing agencies. Activities included the promotion of SALT technology, sericulture, drafting conservation plans and promoting mixed farming of crops and livestock. The objectives of the project was to “take necessary action to ensure ecologically acceptable management of the natural resources in the catchment areas of the Mahaweli River”.